Student Protestors plan to continue their sit-in at SU administration building after rejecting what was called 'final response' by University Chancellor Kent Syverud. UPDATE: Students plan protest at Chancellor's residence; 2:00 p.m. rally on campus; 2:45 vigil with speakers, singers, poets and testimonies. 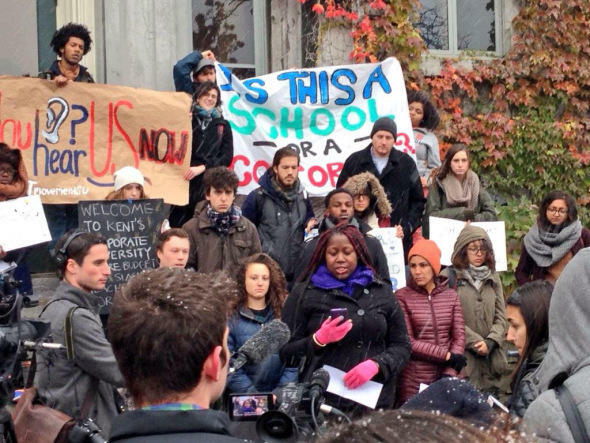 A group of Syracuse University organizations is vowing to continue protesting even though Chancellor Kent Syverud says he has given final written response. The General Body has been participating in a sit in and has held rallies for 10 days now. Members of the group say they’re pleased the administration has acknowledged many of their grievances, but add that some of their largest concerns haven’t been adequately addressed. For example, student Laura Cohen says the closing of the support center for victims of sexual assault is still a sore spot. Clearly, we have not solved issues of transparency, diversity, or democracy on campus, whichTHE General Body continues to fight for. THE General Body remains committed to movingforward on this process and needs cooperation from administration. We realize the list ofgrievances and needs is long – this only reflects the magnitude of ongoing problems that have yetto be adequately addressed. In his letter to the University community, Chancellor Syverud apologized for the poor handling of the center’s closure, but otherwise has not indicated he would reverse the decision. He’s advising The General Body to work with elected student representatives and governing organizations to resolve their problems from this point forward. Syverud says the administration now wants to focus on the needs of the entire student body. The General Body says they will continue protesting until all of their demands have been met. Syracuse University Demonstrators Address Chancellor's "Final Written Response"
A group of Syracuse University student organizations says progress has been made but is still insisting the administration can do more to meet their demands. Kent Syverud, Chancellor of the university, released what he called the administrations final response to THE General Body Wednesday night. THE General Body has been holding a sit-in at Crouse-Hinds Hall for the past ten days. Colton Jones, a member of THE General Body, says that specific problems, such as the closing of the advocacy center, have yet to be addressed by the current administration. Syracuse University officials have taken the first step in going completely smoke-free. A letter was sent out earlier today to Syracuse students, faculty, and staff, stating that Syracuse University will become a smoke-free campus beginning July 1, 2015. Officials say this will allow the campus to provide a healthy environment for students to thrive. All Syracuse University owned buildings will be going smoke-free including all outdoor venues with the exception of the Carrier Dome, the Sheraton Hotel, Drumlins, and Syracuse Stage. Syracuse University’s new Chancellor is ready to make some changes and stake out some positions after completing his first semester on the job. WAER’s Chris Bolt reports Kent Syverud preaches transparency and is letting the public in on issues that affect campus and the local community.